For other uses, see Choctaw (disambiguation). The Choctaw (in the Choctaw language, Chahta)[note 1] are a Native American people originally occupying what is now the Southeastern United States (modern-day Alabama, Florida, Mississippi and Louisiana). Their Choctaw language belongs to the Muskogean language family group. Hopewell and Mississippian cultures, who lived throughout the east of the Mississippi River valley and its tributaries. About 1,700 years ago, the Hopewell people built Nanih Waiya, a great earthwork mound located in what is central present-day Mississippi. It is still considered sacred by the Choctaw. The early Spanish explorers of the mid-16th century in the Southeast encountered Mississippian-culture villages and chiefs. The anthropologist John R. Swanton suggested that the Choctaw derived their name from an early leader. Henry Halbert, a historian, suggests that their name is derived from the Choctaw phrase Hacha hatak (river people). The Choctaw coalesced as a people in the 17th century, and developed three distinct political and geographical divisions: eastern, western and southern. These different groups sometimes created distinct, independent alliances with nearby European powers. These included the French, based on the Gulf Coast and in Louisiana; the English of the Southeast, and the Spanish of Florida and Louisiana during the colonial era. During the American Revolution, most Choctaw supported the Thirteen Colonies' bid for independence from the British Crown. They never went to war against the United States but they were forcibly relocated in 1831–1833, as part of the Indian Removal, in order for the US to take over their land for development by European Americans. In the 19th century, the Choctaw were classified by European Americans as one of the "Five Civilized Tribes" because they adopted numerous practices of their United States neighbors. The Choctaw and the United States (US) agreed to nine treaties. By the last three, the US gained vast land cessions; they removed most Choctaw west of the Mississippi River to Indian Territory, sending them on a forced migration far from their homelands. The Choctaw were the first Native American tribe forced to relocate under the Indian Removal Act. The Choctaw were exiled from their land because the U.S. desired its resources, and to sell it for settlement and agricultural development by European Americans. Some US leaders believed that by reducing conflict between the peoples, they were saving the Choctaw from extinction. The Choctaw negotiated the largest area and most desirable lands in Indian Territory. Their early government had three districts, each with its own chief, who together with the town chiefs sat on their National Council. They appointed a Choctaw Delegate to represent them to the US government in Washington, DC. By the 1831 Treaty of Dancing Rabbit Creek, those Choctaw who chose to stay in the newly formed state of Mississippi were to be considered state and U.S. citizens; they were one of the first major non-European ethnic groups to be granted citizenship. Article 14 in the 1830 treaty with the Choctaw stated Choctaws may wish to become citizens of the United States under the 14th Article of the Treaty of Dancing Rabbit Creek on all of the combined lands which were consolidated under Article I from all previous treaties between the United States and the Choctaw. During the American Civil War, the Choctaw in both Oklahoma and Mississippi mostly sided with the Confederate States of America. The Confederacy had suggested to their leaders that it would support a state under Indian control if it won the war. After the Civil War, the Mississippi, Alabama, and Louisiana Choctaw fell into obscurity for some time. The Choctaw in Oklahoma no longer considered the Mississippi Choctaw part of the Choctaw Nation. However, Jack Amos legally challenged the Choctaw Nation's stance at the turn of the 20th century. In 1978, the United Supreme Court of the United States held that all remnants of the Choctaw Nation are entitled to all rights of the federally recognized Nation. The American Indian Policy Review Commission Final Report Volume I, Chapter 11, Page 468 on May 19, 1977 federally acknowledged/recognized the existence of the Choctaw Communities of Mobile and Washington Counties which are along the Tombigbee and Mobile Rivers where Choctaw Treaties were negotiated in various Choctaw Treaties. The Choctaw in Oklahoma struggled to build a nation. They transferred the Choctaw Academy there and opened an academy for girls in the 1840s. In the aftermath of the Dawes Act in the late 19th century, the US dissolved tribal governments in order to extinguish Indian land claims and admit the Indian and Oklahoma territories as a state in 1907. From that period, the US appointed chiefs of the Choctaw and other tribes in the former Indian Territory. During World War I, Choctaw soldiers served in the U.S. military as the first Native American codetalkers, using the Choctaw language. After the Indian Reorganization Act of 1934, the Choctaw reconstituted their government. The Choctaw Nation had kept their culture alive despite years of pressure for assimilation. The Choctaw are the third-largest federally recognized tribe. Since the mid-twentieth century, the Choctaw have created new institutions, such as a tribal college, housing authority, and justice system. Today the Choctaw Nation of Oklahoma, the Mississippi Band of Choctaw Indians, and the Jena Band of Choctaw Indians are the federally recognized Choctaw tribes. Mississippi also recognizes another band, and smaller Choctaw groups are located in Louisiana, Alabama, and Texas. The Alabama Choctaw who are federally recognized under 24 C.F.R 1000 and 25 U.S.C. 4101 called the Native American Housing Self-Determination Act of 1986 (formerly the "Indian" Housing Act of 1937) under which the United States Federal Government jointly owns the MOWA Choctaw Indian Reservation as land held in trust as a reservation and for the MOWA Band of Choctaw Indians per multiple deeds in public records in Mobile County, Alabama Department of Revenue Records. The Department of Interior has listed the MOWA Band of Choctaw Indians as a trustee of Natural Resources in the Southeast Region of the United States. The National Park Service under the Secretary of Interior has posted public notice of the MOWA Choctaw Indian Reservation in Alabama. The Office of the Secretary of Interior issued the MOWA Band of Choctaw Indians its Federal Bureau of Investigations ORI number formally acknowledging the Government to Government relationship in 1999. The MOWA Band of Choctaw Indians in Alabama and the Alabama Inter-Tribal Council, which is composed solely of non-federally recognized tribes under Chief Framon Weaver, obtained a US Supreme Court ruling that sovereign immunity applies not only to entities such as the Alabama Inter-Tribal Council as an arm of the tribe, but also that sovereign immunity is inherent and possessed of Indians because they are Indians. This decision of the U.S. Federal Court of Appeals was upheld by the United States Supreme Court in 2002. Many thousands of years ago groups classified by anthropologists as Paleo-Indians lived in what today is referred to as the American South. These groups were hunter-gatherers who hunted a wide range of animals, including a variety of megafauna, which became extinct following the end of the Pleistocene age. The 19th-century historian Horatio B. Cushman noted that Choctaw oral history accounts suggested their ancestors had known of mammoths in the Tombigbee River area; this suggests that the Choctaw ancestors had been in the Mississippi area for at least 4,000–8,000 years. Cushman wrote: "the ancient Choctaw through their tradition (said) 'they saw the mighty beasts of the forests, whose tread shook the earth." Scholars believe that Paleo-Indians were specialized, highly mobile foragers who hunted late Pleistocene fauna such as bison, mastodons, caribou, and mammoths. Direct evidence in the Southeast is meager, but archaeological discoveries in related areas support this hypothesis. Later cultures became more complex. Moundbuilding cultures included the Woodland period people who first built Nanih Waiya. Scholars believe the mound was contemporary with such earthworks as Igomar Mound in Mississippi and Pinson Mounds in Tennessee. Based on dating of surface artifacts, the Nanih Waiya mound was likely constructed and first occupied by indigenous peoples about 0–300 CE, in the Middle Woodland period. The original site was bounded on three sides by an earthwork circular enclosure, about ten feet high and encompassing a square mile. Occupation of Nanih Waiya and several smaller nearby mounds likely continued through 700 CE, the Late Woodland Period. The smaller mounds may also have been built by later cultures. As they have been lost to cultivation since the late 19th century and the area has not been excavated, theories have been speculation. When the Spanish made their first forays inland in the 16th century from the shores of the Gulf of Mexico, they encountered some chiefdoms of the Mississippians, but others were already in decline, or had disappeared. The Mississippian culture are the peoples encountered by other early Spanish explorers, beginning on April 2, 1513, with Juan Ponce de León's Florida landing and the 1526 Lucas Vázquez de Ayllón expedition in South Carolina and Georgia region. A Spanish expedition in the later 16th century, in what is now western North Carolina, encountered people of the Mississippian culture at Joara and settlements further west. The Spanish built a fort at Joara and left a garrison there, as well as five other forts. The following year all the Spanish garrisons were killed and the forts destroyed by the Native Americans, who ended Spanish colonization attempts in the interior. The contemporary historian Patricia Galloway argues from fragmentary archaeological and cartographic evidence that the Choctaw did not exist as a unified people before the 17th century. Only then did various southeastern peoples, remnants of Moundville, Plaquemine, and other Mississippian cultures, coalesce to form a self-consciously Choctaw people. The historical homeland of the Choctaw, or of the peoples from whom the Choctaw nation arose, included the area of Nanih Waiya, an earthwork mound in present-day Winston County, Mississippi, which they considered sacred ground. Their homeland was bounded by the Tombigbee River to the east, the Pearl River on the north and west, and "the Leaf-Pascagoula system" to the South. This area was mostly uninhabited during the Mississippian -culture period. In Histoire de La Louisiane (Paris, 1758), French explorer Antoine-Simon Le Page du Pratz recounted that "...when I asked them from whence the Chat-kas [sic] came, to express the suddenness of their appearance they replied that they had come out from under the earth." American scholars took this as intended to explain the Choctaws' immediate appearance, and not a literal creation account. It was perhaps the first European writing that included part of the Choctaw origin story. A people who by many peculiar customs, are very different from the other red men on the continent ... they are the Chactaws [sic], more commonly known by the name of the Flatheads. These people are the only nation from whom I [sic] could learn any idea of a traditional account of a first origin; and that is their coming out of a hole in the ground, which they shew between their nation and the Chicsaws [sic]; they tell us also that their neighbours were surprised at seeing a people rise at once out of the earth. Early 19th century and contemporary Choctaw storytellers describe that the Choctaw people emerged from either Nanih Waiya mound or cave. A companion story describes their migration journey from the west, beyond the Mississippi River, when they were directed by their leader's use of a sacred red pole. The Choctaws, a great many winters ago, commenced moving from the country where they then lived, which was a great distance to the west of the great river and the mountains of snow, and they were a great many years on their way. A great medicine man led them the whole way, by going before with a red pole, which he stuck in the ground every night where they encamped. This pole was every morning found leaning to the east, and he told them that they must continue to travel to the east until the pole would stand upright in their encampment, and that there the Great Spirit had directed that they should live. After the castaway Cabeza de Vaca of the ill-fated Narváez expedition returned to Spain, he described to the Court that the New World was the "richest country in the world." It commissioned the Spaniard Hernando de Soto to lead the first expedition into the interior of the North American continent. De Soto, convinced of the "riches", wanted Cabeza de Vaca to accompany him on the expedition. Cabeza de Vaca declined because of a payment dispute. From 1540 to 1543, Hernando de Soto traveled through present-day Florida and Georgia, and then into the Alabama and Mississippi areas that would later be inhabited by the Choctaw. De Soto had the best-equipped militia at the time. As the brutalities of the de Soto expedition through the Southeast became known, ancestors to the Choctaw rose in defense. The Battle of Mabila, an ambush arranged by Chief Tuskaloosa, was a turning point for the de Soto venture. The battle "broke the back" of the campaign, and they never fully recovered. Hernando de Soto, leading his well-equipped Spanish fortune hunters, made contact with the Choctaws in the year 1540. He had been one of a triumvirate which wrecked and plundered the Inca empire and, as a result, was one of the wealthiest men of his time. His invading army lacked nothing in equipage. In true conquistador style, he took as hostage a chief named Chief Tuskaloosa, demanding of him carriers and women. The carriers he got at once. The women, Tuscaloosa said, would be waiting in Mabila (Mobile). The chief neglected to mention that he had also summoned his warriors to be waiting in Mabila. On October 18, 1540, de Soto entered the town and received a gracious welcome. The Choctaws feasted with him, danced for him, then attacked him. The archaeological record for the period between 1567 and 1699 is not complete or well-studied. It appears that some Mississippian settlements were abandoned well before the 17th century. Similarities in pottery coloring and burials suggest the following scenario for the emergence of the distinctive Choctaw society. According to Patricia Galloway, the Choctaw region of Mississippi, generally located between the Yazoo basin to the north and the Natchez bluffs to the south, was slowly occupied by Burial Urn people from the Bottle Creek Indian Mounds area in the Mobile, Alabama delta, along with remnants of people from the Moundville chiefdom (near present-day Tuscaloosa, Alabama), which had collapsed some years before. Facing severe depopulation, they fled westward, where they combined with the Plaquemines and a group of "prairie people" living near the area. When this occurred is not clear. In the space of several generations, they created a new society which became known as Choctaw (albeit with a strong Mississippian background). Other scholars note the Choctaw oral history recounting their long migration from west of the Mississippi River. In 1682, La Salle was the first French explorer to venture into the southeast along the Mississippi River. His expedition did not meet with the Choctaw; it established a post along the Arkansas River. The post signaled to the English that the French were serious at colonization in the South. The Choctaw allied with French colonists as a defense against the English, who had been taking Choctaws as captives for the Indian slave trade. As the historian Greg O'Brien has noted, the Choctaw developed three distinct political and geographic regions, which during the colonial period sometimes had differing alliances with trading partners among the French, Spanish and English. They also expressed differences during and after the American Revolutionary War. Their divisions were roughly eastern, western (near present-day Vicksburg, Mississippi) and southern (Six Towns). Each division was headed by a principal chief, and subordinate chiefs led each of the towns within the area. All the chiefs would meet on a National Council, but the society was highly decentralized for some time. The French were the main trading partners of the Choctaw before the Seven Years' War, and the British had established some trading. Trade deputes between the eastern and western division led to the Choctaw Civil War being fought between 1747 and 1750, with the pro-French eastern division emerging victorious. After Great Britain defeated France in the Seven Years' War, it ceded its territory east of the Mississippi River. From 1763 to 1781, Britain was the Choctaw main trading partner. With Spanish forces based in New Orleans in 1766, when they took over French territory west of the Mississippi, the Choctaw sometimes traded with them to the west. Spain declared war against Great Britain during the American Revolution in 1779. During the American Revolution, the Choctaw divided over whether to support Britain or Spain. Some Choctaw warriors from the western and eastern divisions supported the British in the defense of Mobile and Pensacola. Chief Franchimastabé led a Choctaw war party with British forces against American rebels in Natchez. The Americans had left by the time Franchimastabé arrived, but the Choctaw occupied Natchez for weeks and convinced residents to remain loyal to Britain. Other Choctaw companies joined Washington's army during the war, and served the entire duration. Bob Ferguson, a Southeastern Indian historian, noted, "[In] 1775 the American Revolution began a period of new alignments for the Choctaws and other southern Indians. Choctaw scouts served under Washington, Morgan, Wayne and Sullivan." Over a thousand Choctaw fought for Britain, largely against Spain's campaigns along the Gulf Coast. At the same time, a significant number of Choctaw aided Spain. Ferguson wrote that with the end of the Revolution, "'Franchimastabe', Choctaw head chief, went to Savannah, Georgia to secure American trade." In the next few years, some Choctaw scouts served in Ohio with U.S. General Anthony Wayne in the Northwest Indian War. George Washington (first U.S. President) and Henry Knox (first U.S. Secretary of War) proposed the cultural transformation of Native Americans. Washington believed that Native American society was inferior to that of the European Americans. He formulated a policy to encourage the "civilizing" process, and Thomas Jefferson continued it. The historian Robert Remini wrote, "[T]hey presumed that once the Indians adopted the practice of private property, built homes, farmed, educated their children, and embraced Christianity, these Native Americans would win acceptance from white Americans." Washington's six-point plan included impartial justice toward Indians; regulated buying of Indian lands; promotion of commerce; promotion of experiments to civilize or improve Indian society; presidential authority to give presents; and punishing those who violated Indian rights. The government appointed agents, such as Benjamin Hawkins, to live among the Indians and to teach them through example and instruction, how to live like whites. While living among the Choctaw for nearly 30 years, Hawkins married Lavinia Downs, a Choctaw woman. As the people had a matrilineal system of property and hereditary leadership, their children were born into the mother's clan and gained their status from her people. In the late eighteenth and early nineteenth century, a number of Scots-Irish traders lived among the Choctaw and married high-status women. Choctaw chiefs saw these as strategic alliances to build stronger relationships with the Americans in a changing environment that influenced ideas of capital and property. The children of such marriages were Choctaw, first and foremost. Some of the sons were educated in Anglo-American schools and became important interpreters and negotiators for Choctaw-US relations. Whereas it hath at this time become peculiarly necessary to warn the citizens of the United States against a violation of the treaties made at Hopewell, on the Keowee, on the 28th day of November, 1785, and on the 3d and 10th days of January, 1786, between the United States and the Cherokee, Choctaw, and Chickasaw nations of Indians ... I do by these presents require, all officers of the United States, as well civil as military, and all other citizens and inhabitants thereof, to govern themselves according to the treaties and act aforesaid, as they will answer the contrary at their peril. —  George Washington, Proclamation Regarding Treaties, Regarding Treaties with the Cherokee, Choctaw and Chickasaw 1790. After the rituals, the Choctaw asked John Woods to live with them to improve communication with the U.S. In exchange they allowed Taboca to visit the United States Congress. On January 3, 1786, the Treaty of Hopewell was signed. Article 11 stated, "[T]he hatchet shall be forever buried, and the peace given by the United States of America, and friendship re-established between the said states on the one part, and all the Choctaw nation on the other part, shall be universal; and the contracting parties shall use their utmost endeavors to maintain the peace given as aforesaid, and friendship re-established." The treaty required Choctaws to return escaped slaves to colonists, to turn over any Choctaw convicted of crimes by the U.S., establish borderlines between the U.S. and Choctaw Nation, and the return any property captured from colonists during the Revolutionary War. After the Revolutionary War, the Choctaw were reluctant to ally themselves with countries hostile to the United States. John Swanton wrote, "the Choctaw were never at war with the Americans. A few were induced by Tecumseh (a Shawnee leader who sought support from various Native American tribes) to ally themselves with the hostile Creeks [in the early 19th century], but the Nation as a whole was kept out of anti-American alliances by the influence of Apushmataha, greatest of all Choctaw chiefs." Portraits of Pushmataha (left) and Tecumseh. "These white Americans ... give us fair exchange, their cloth, their guns, their tools, implements, and other things which the Choctaws need but do not make ... They doctored our sick; they clothed our suffering; they fed our hungry ... So in marked contrast with the experience of the Shawnees, it will be seen that the whites and Indians in this section are living on friendly and mutually beneficial terms." Pushmataha, 1811 – Sharing Choctaw History. ---------------------"Where today are the Pequot? Where are the Narragansett, the Mochican, the Pocanet, and other powerful tribes of our people? They have vanished before the avarice and oppression of the white man, as snow before the summer sun ... Sleep not longer, O Choctaws and Chickasaws ... Will not the bones of our dead be plowed up, and their graves turned into plowed fields?" Tecumseh, 1811 – The Portable North American Indian Reader. Early in 1811, the Shawnee leader Tecumseh gathered Indian tribes in an alliance to try to expel U.S. settlers from the Northwest area south of the Great Lakes. Tecumseh met the Choctaws to persuade them to join the alliance. Pushmataha, considered by historians to be the greatest Choctaw leader, countered Tecumseh's influence. As chief for the Six Towns (southern) district, Pushmataha strongly resisted such a plan, arguing that the Choctaw and their neighbors the Chickasaw had always lived in peace with European Americans, had learned valuable skills and technologies, and had received honest treatment and fair trade. The joint Choctaw-Chickasaw council voted against alliance with Tecumseh. On Tecumseh's departure, Pushmataha accused him of tyranny over his own Shawnee and other tribes. Pushmataha warned Tecumseh that he would fight against those who fought the United States. On the eve of the War of 1812, Governor William C. C. Claiborne of Louisiana sent interpreter Simon Favre to give a talk to the Choctaws, urging them to stay out of this "white man's war." Ultimately, however, the Choctaw did become involved, and with the outbreak of the war, Pushmataha led the Choctaws in alliance with the U.S., arguing in favor of opposing the Creek Red Sticks' alliance with Britain after the massacre at Fort Mims. Pushmataha arrived at St. Stephens, Alabama in mid-1813 with an offer of alliance and recruitment. He was escorted to Mobile to speak with General Flournoy, then commanding the district. Flournoy initially declined Pushmataha's offer and offended the chief. However, Flournoy's staff quickly convinced him to reverse his decision. A courier with a message accepting the offer of alliance caught up with Pushmataha at St. Stephens. Returning to Choctaw territory, Pushmataha raised a company of 125 Choctaw warriors with a rousing speech and was commissioned (as either a lieutenant colonel or a brigadier general) in the United States Army at St. Stephens. After observing that the officers and their wives would promenade along the Alabama River, Pushmataha summoned his own wife to St. Stephens to accompany him. He joined the U.S. Army under General Ferdinand Claiborne in mid-November, and some 125 Choctaw warriors took part in an attack on Creek forces at Kantachi (near present day Econochaca, Alabama) on 23 December 1813. With this victory, Choctaw began to volunteer in greater numbers from the other two districts of the tribe. By February 1814, a larger band of Choctaws under Pushmataha had joined General Andrew Jackson's force for the sweeping of the Creek territories near Pensacola, Florida. Many Choctaw departed from Jackson's main force after the final defeat of the Creek at the Battle of Horseshoe Bend. By the Battle of New Orleans, only a few Choctaw remained with the army; they were the only Native American tribe represented in the battle. In October 1820, Andrew Jackson and Thomas Hinds were sent as commissioners representing the United States, to conduct a treaty that would require the Choctaw to surrender to the United States a portion of their country located in present day Mississippi. They met with chiefs, mingos (leaders), and headsmen such as Colonel Silas Dinsmore and Chief Pushmataha at Doak's Stand on the Natchez Trace. Finally Jackson resorted to threats and a temper tantrum to gain their consent. He warned them of the loss of American friendship; he promised to wage war against them and destroy the Nation; finally he shouted his determination to remove them whether they liked it or not. The convention began on October 10 with a talk by "Sharp Knife", the nickname of Jackson, to more than 500 Choctaws. Pushmataha accused Jackson of deceiving them about the quality of land west of the Mississippi. Pushmataha responded to Jackson's retort with "I know the country well ... The grass is everywhere very short ... There are but few beavers, and the honey and fruit are rare things." Jackson resorted to threats, which pressured the Choctaws to sign the Doak's Stand treaty. Pushmataha would continue to argue with Jackson about the conditions of the treaty. Pushmataha assertively stated "that no alteration shall be made in the boundaries of the portion of our territory that will remain, until the Choctaw people are sufficiently progressed in the arts of civilization to become citizens of the States, owning land and homes of their own, on an equal footing with the white people." Jackson responded with "That ... is a magnificent rangement and we consent to it, [American Citizenship], readily." Historian Anna Lewis stated that Apuckshunubbee, a Choctaw district chief, was blackmailed by Jackson to sign the treaty. On October 18, the Treaty of Doak's Stand was signed. Article 4 of the Treaty of Doak's Stand prepared Choctaws to become U.S. citizens when he or she became "civilized." This article would later influence Article 14 in the Treaty of Dancing Rabbit Creek. Apuckshunubbee, Pushmataha, and Mosholatubbee, the principal chiefs of the three divisions of Choctaw, led a delegation to Washington City (the 19th century name for Washington, D.C.) to discuss the problems of European Americans' squatting on Choctaw lands. They sought either expulsion of the settlers or financial compensation for the loss of their lands. The group also included Talking Warrior, Red Fort, Nittahkachee, who was later Principal Chief; Col. Robert Cole and David Folsom, both Choctaw of mixed-race ancestry; Captain Daniel McCurtain, and Major John Pitchlynn, the U.S. interpreter, who had been raised by the Choctaw after having been orphaned when young and married a Choctaw woman. Apuckshunubbee died in Maysville, Kentucky of an accident during the trip before the party reached Washington. Pushmataha met with President James Monroe and gave a speech to Secretary of War John C. Calhoun, reminding him of the longstanding alliances between the United States and the Choctaws. He said, "[I] can say and tell the truth that no Choctaw ever drew his bow against the United States ... My nation has given of their country until it is very small. We are in trouble." On January 20, 1825, Pushmataha and other chiefs signed the Treaty of Washington City, by which the Choctaw ceded more territory to the United States. Pushmataha died in Washington of a respiratory disease described as croup, before the delegation returned to the Choctaw Nation. He was given full U.S. military burial honors at the Congressional Cemetery in Washington, D.C. The deaths of these two strong division leaders was a major loss to the Choctaw Nation, but younger leaders were arising who were educated in European-American schools and led adaptation of the culture. Threatened with European-American encroachment, the Choctaw continued to adapt and take on some technology, housing styles, and accepted missionaries to the Choctaw Nation, in the hopes of being accepted by the Mississippi and national government. In 1825 the National Council approved the founding of the Choctaw Academy for education of its young men, urged by Peter Pitchlynn, a young leader and future chief. The school was established in Blue Spring, Scott County, Kentucky; it was operated there until 1842, when the staff and students were transferred to the Choctaw Nation, Indian Territory. There they founded the Spencer Academy in 1844. With the election of Andrew Jackson as president in 1828, many of the Choctaw realized that removal was inevitable. They continued to adopt useful European practices but faced Jackson's and settlers' unrelenting pressure. In March 1830 the division chiefs resigned, and the National Council elected Greenwood LeFlore, chief of the western division, as Principal Chief of the nation to negotiate with the US government on their behalf, the first time such a position had been authorized. Believing removal was inevitable and hoping to preserve rights for Choctaw in Indian Territory and Mississippi, LeFlore drafted a treaty and sent it to Washington, DC. There was considerable turmoil in the Choctaw Nation among people who thought he would and could resist removal, but the chiefs had agreed they could not undertake armed resistance. At Andrew Jackson's request, the United States Congress opened what became a fierce debate on an Indian Removal Bill. In the end, the bill passed, but the vote was very close. The Senate passed the measure 28 to 19, while in the House it narrowly passed, 102 to 97. Jackson signed the legislation into law June 30, 1830, and turned his focus onto the Choctaw in Mississippi Territory. To the voters of Mississippi. Fellow Citizens:-I have fought for you, I have been by your own act, made a citizen of your state; ... According to your laws I am an American citizen, ... I have always battled on the side of this republic ... I have been told by my white brethren, that the pen of history is impartial, and that in after years, our forlorn kindred will have justice and "mercy too" ... I wish you would elect me a member to the next Congress of the [United] States. —  Mushulatubba, Christian Mirror and N.H. Observer, July 1830. On August 25, 1830, the Choctaw were supposed to meet with Andrew Jackson in Franklin, Tennessee, but Greenwood Leflore, a district Choctaw chief, informed Secretary of War John H. Eaton that his warriors were fiercely opposed to attending. President Jackson was angered. Journalist Len Green writes "although angered by the Choctaw refusal to meet him in Tennessee, Jackson felt from LeFlore's words that he might have a foot in the door and dispatched Secretary of War Eaton and John Coffee to meet with the Choctaws in their nation." Jackson appointed Eaton and General John Coffee as commissioners to represent him to meet the Choctaws at the Dancing Rabbit Creek near present-day Noxubee, Mississippi Territory. although the actual site of the Treaty was never specifically mentioned. Say to them as friends and brothers to listen [to] the voice of their father, & friend. Where [they] now are, they and my white children are too near each other to live in harmony & peace ... It is their white brothers and my wishes for them to remove beyond the Mississippi, it [contains] the [best] advice to both the Choctaws and Chickasaws, whose happiness ... will certainly be promoted by removing ... There ... their children can live upon [it as] long as grass grows or water runs ... It shall be theirs forever ... and all who wish to remain as citizens [shall have] reservations laid out to cover [their improv]ements; and the justice due [from a] father to his red children will [be awarded to] them. [Again I] beg you, tell them to listen. [The plan proposed] is the only one by which [they can be] perpetuated as a nation ... I am very respectfully your friend, & the friend of my Choctaw and Chickasaw brethren. Andrew Jackson. —  Andrew Jackson to the Choctaw & Chickasaw Nations, 1829. The commissioners met with the chiefs and headmen on September 15, 1830, at Dancing Rabbit Creek. In a carnival-like atmosphere, they tried to explain the policy of removal to an audience of 6,000 men, women, and children. The Choctaws faced migration or submitting to U.S. law as citizens. The treaty required them to cede their remaining traditional homeland to the United States; however, a provision in the treaty made removal more acceptable. On September 27, 1830, the Treaty of Dancing Rabbit Creek was signed. It represented one of the largest transfers of land that was signed between the U.S. Government and Native Americans without being instigated by warfare. By the treaty, the Choctaw signed away their remaining traditional homelands, opening them up for European-American settlement. Article 14 allowed for some Choctaw to stay in Mississippi, and nearly 1,300 Choctaws chose to do so. They were one of the first major non-European ethnic group to become U.S. citizens. Article 22 sought to put a Choctaw representative in the U.S. House of Representatives. 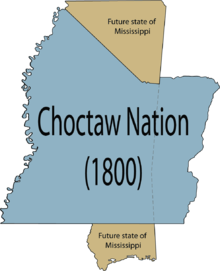 The Choctaw at this crucial time split into two distinct groups: the Choctaw Nation of Oklahoma and the Mississippi Band of Choctaw Indians. The nation retained its autonomy, but the tribe in Mississippi submitted to state and federal laws. In 1831, a young 22-year-old George W. Harkins wrote the Farewell Letter to the American People. This portrait was taken in the 1860s. Approximately 4,000–6,000 Choctaw remained in Mississippi in 1831 after the initial removal efforts. The U.S. agent William Ward, who was responsible for Choctaw registration in Mississippi under article XIV, strongly opposed their treaty rights. Although estimates suggested 5000 Choctaw remained in Mississippi, only 143 family heads (for a total of 276 adult persons) received lands under the provisions of Article 14. For the next ten years, the Choctaws in Mississippi were objects of increasing legal conflict, racism, harassment, and intimidation. The Choctaws described their situation in 1849: "we have had our habitations torn down and burned, our fences destroyed, cattle turned into our fields and we ourselves have been scourged, manacled, fettered and otherwise personally abused, until by such treatment some of our best men have died." Joseph B. Cobb, who moved to Mississippi from Georgia, described the Choctaw as having "no nobility or virtue at all, and in some respect he found blacks, especially native Africans, more interesting and admirable, the red man's superior in every way. The Choctaw and Chickasaw, the tribes he knew best, were beneath contempt, that is, even worse than black slaves." Removal continued throughout the 19th and 20th centuries. In 1846 1,000 Choctaw removed, and in 1903, another 300 Mississippi Choctaw were persuaded to move to the Nation in Oklahoma. By 1930 only 1,665 were estimated to have remained in Mississippi. I do certify that the foregoing persons did apply to me as agent to have their names registered to remain five years and become citizens of the States before the 24th (August) 1831. Choctaw chief Greenwood LeFlore's plantation home, Malmaison, was built in 1852 near Greenwood, Mississippi and was described as a "palace in the wilderness." In the 1840s, the Choctaw chief Greenwood LeFlore stayed in Mississippi after the signing of Treaty of Dancing Rabbit Creek and became an American citizen, a successful businessman, and a state politician. He was elected as a Mississippi representative and senator, was a fixture of Mississippi high society, and a personal friend of Jefferson Davis. He represented his county in the state house for two terms and served as a state senator for one term. Some of the elite used Latin language, an indulgence used by some politicians. LeFlore, in defense of his heritage, spoke in the Choctaw language and asked the Senate floor which was better understood, Latin or Choctaw. Midway through the Great Irish Famine (1845–1849), the Choctaw agency at Fort Smith, Arkansas organised a collection which amounted to $170 and sent it to help starving Irish men, women, and children. The Arkansas Intelligencer reported that "all subscribed, agents, missionaries, traders and Indians, a considerable portion of which fund was made up by the latter." It had been just 16 years since the Choctaw people had experienced the Trail of Tears, and they had faced starvation ... It was an amazing gesture. By today's standards, it might be a million dollars" according to Judy Allen, editor of the Choctaw Nation of Oklahoma's newspaper, Bishinik, based at the Oklahoma Choctaw tribal headquarters in Durant, Oklahoma. For the Choctaw who remained in or returned to Mississippi after 1855, the situation deteriorated. Many lost their lands and money to unscrupulous whites. The state of Mississippi refused the Choctaw any participation in government. Their limited understanding of the English language caused them to live in isolated groups. In addition, they were prohibited from attending any of the few institutions of higher learning, as the European Americans considered them free people of color and excluded from the segregated white institutions. The state had no public schools prior to those established during the Reconstruction era. Choctaws ... were at the mercy of the whites who could commit crimes against them without fear of the law. Even black slaves had more legal rights than did the Choctaws during this period. In May 1853, Choctaws sailed out of Mobile, Alabama for Boston and New York. They were to participate in America's "first" world's fair: Exhibition of the Industry of All Nations. CHOCTAW INDIANS FOR THE CRYSTAL PALACE.—Capt. Post, of the schooner J. S. Lane, who arrived on Sunday, from Mobile, states that on the 26th ultimo, off the Great Isaacs, he spoke the brig Pembroke, from, Mobile for New-York, having on board a company of Choctaw Indians, for exhibition at the Crystal Palace. THE CHOCTAW INDIANS.—Each succeeding performance of these interesting aborigines prove. that they are increasing in popularity with our citizens. Their delineations of the "Great Ball Play," drew down the plaudits of the house. They appear this evening and to-morrow, after which they quit Brooklyn, wending their way homewards. The Brooklyn Museum is not half large enough to contain the crowds that flock nightly to its doors. There will be afternoon performances this day and to-morrow, to accommodate the young folks. CHOCTAW INDIANS.—These wonderful and thrilling Exhibitions are attracting intense interest. The crowds that see them, go away astonished and delighted with valuable information. Among the Company are Hoocha, their chief, aged 58 years; Teschu the Medicine man, aged 58; and Silver smith. This is the greatest opportunity ever given to the New-Yorkers to obtain a full idea of Indian life. The GREAT BALL PLAY, and the grand exciting WAR DANCE, will be exhibited this Evening, with other Dances and Songs of great interest. At the Assembly Rooms, Broadway, above Howard-st. Doors open at 7. Exercises to commence at 8. Admission 25 cents. Reserved Seats 50 cents. Jackson McCurtain, Lieutenant Colonel of the First Choctaw Battalion, CSA, future Principal Chief. At the beginning of the American Civil War, Albert Pike was appointed as Confederate envoy to Native Americans. In this capacity he negotiated several treaties, including the Treaty with Choctaws and Chickasaws in July 1861. The treaty covered sixty-four terms, covering many subjects, such as Choctaw and Chickasaw nation sovereignty, Confederate States of America citizenship possibilities, and an entitled delegate in the House of Representatives of the Confederate States of America. In 1891, Horatio B. Cushman, a noted author and historian, wrote that the "United States abandoned the Choctaws and Chickasaws" when Confederate troops had entered into their nation. The Confederacy encouraged the recruitment of American Indians east of the Mississippi River in 1862. John W. Pierce and Samuel G. Spann organized the Choctaw Indians in Mississippi between 1862 and 1863. Pierce's 1st Choctaw Battalion was established in February 1863. They tracked Confederate deserters in Jones County and surrounding areas. After a Confederate troop train wreck, referred to as the Chunky Creek Train Wreck of 1863, near Hickory, Mississippi, the battalion led rescue and recovery efforts. Led by Jack Amos and Elder Jackson, the Indians rushed to the scene, stripped, and plunged into the flooded creek. Many of the passengers were rescued due to their heroic acts. Noted historian Clara Sue Kidwell wrote, "in an act of heroism in Mississippi, Choctaws rescued twenty-three survivors and retrieved ninety bodies when a Confederate troop train plunged off a bridge and fell into the Chunky River." The battalion was at the Battle of Ponchatoula in March 1863. After the battle, a majority of the Indians deserted. The remaining members returned to Ponchatoula where some were captured. The prisoners were taken to New Orleans and later New York City, where two died. Pierce's 1st Choctaw Battalion was disbanded on May 9, 1863. After S. G. Spann was authorized to raise Indian troops in April 1863, he soon established a recruiting camp in Mobile, Alabama and Newton County, Mississippi. Spann placed recruiting advertisements in the Mobile Advertiser and Register. The advertisements appeared in the newspaper for most of the summer of 1863. Spann's organization was known as Spann's Independent Scouts. It was soon re-organized as the 18th Battalion, Alabama Cavalry. The unit helped with Gideon J. Pillow's conscription efforts in the fall of 1863. Spann was the commander of U.C.V. Camp Dabney H. Maury which was based in Newton, Mississippi. Spann lived in Meridian, Mississippi at the time he wrote about the deeds of the Choctaw during the Civil War. Choctaw girls in 1868. Smithsonian Institution. From about 1865 to 1914, Mississippi Choctaws were largely ignored by governmental, health, and educational services and fell into obscurity. In the aftermath of the Civil War, their issues were pushed aside in the struggle between defeated Confederates, freedmen and Union sympathizers. Records about the Mississippi Choctaw during this period are non-existent. They had no legal recourse, and were often bullied and intimidated by local whites, who tried to re-establish white supremacy. They chose to live in isolation and practiced their culture as they had for generations. Following the Reconstruction era and conservative Democrats' regaining political power in the late 1870s, white state legislators passed laws establishing Jim Crow laws and legal segregation by race. In addition, they effectively disfranchised freedmen and Native Americans by the new Mississippi constitution of 1890, which changed rules regarding voter registration and elections to discriminate against both groups. The white legislators effectively divided society into two groups: white and "colored," into which they classified Mississippi Choctaw and other Native Americans. They subjected the Choctaw to racial segregation and exclusion from public facilities along with freedmen and their descendants. The Choctaw were non-white, landless, and had minimal legal protection. Because the state remained dependent on agriculture, despite the declining price of cotton, most landless men earned a living by becoming sharecroppers. The women created and sold traditional hand-woven baskets. Choctaw sharecropping declined following World War II as major planters had adopted mechanization, which reduced the need for labor. The Confederacy's loss was also the Choctaw Nation's loss. Prior to removal, the Choctaws had interacted with Africans in their native homeland of Mississippi, and the wealthiest had bought slaves. The Choctaw who developed larger plantations adopted chattel slavery, as practiced by European Americans, to gain sufficient labor. During the antebellum period, enslaved African Americans had more formal legal protection under United States law than did the Choctaw. Moshulatubbee, the chief of the western region, held slaves, as did many of the Europeans who married into the Choctaw nation. The Choctaw took slaves with them to Indian Territory during removal, and descendants purchased others there. They kept slavery until 1866. After the Civil War, they were required by treaty with the United States to emancipate the slaves within their Nation and, for those who chose to stay, offer them full citizenship and rights. Former slaves of the Choctaw Nation were called the Choctaw Freedmen. After considerable debate, the Choctaw Nation granted Choctaw Freedmen citizenship in 1885. In post-war treaties, the US government also acquired land in the western part of the territory and access rights for railroads to be built across Indian Territory. Choctaw chief, Allen Wright, suggested Oklahoma (red man, a portmanteau of the Choctaw words okla "man" and humma "red") as the name of a territory created from Indian Territory in 1890. The improved transportation afforded by the railroads increased the pressure on the Choctaw Nation. It drew large-scale mining and timber operations, which added to tribal receipts. But, the railroads and industries also attracted European-American settlers, including new immigrants to the United States. Faunceway Baptiste, a Choctaw man in 1868, of mixed-race ancestry. Smithsonian Institution. With the goal of assimilating the Native Americans, the Curtis Act of 1898, sponsored by a Native American who believed that was the way for his people to do better, ended tribal governments. In addition, it proposed the end of communal, tribal lands. Continuing the struggle over land and assimilation, the US proposed the end to the tribal lands held in common, and allotment of lands to tribal members in severalty (individually). The US declared land in excess of the registered households needs to be "surplus" to the tribe, and took it for sale to new European-American settlers. In addition, individual ownership meant that Native Americans could sell their individual plots. This would also enable new settlers to buy land from those Native Americans who wished to sell. The US government set up the Dawes Commission to manage the land allotment policy; it registered members of the tribe and made allocations of lands. Beginning in 1894, the Dawes Commission was established to register Choctaw and other families of the Indian Territory, so that the former tribal lands could be properly distributed among them. The final list included 18,981 citizens of the Choctaw Nation, 1,639 Mississippi Choctaw, and 5,994 former slaves (and descendants of former slaves), most held by Choctaws in the Indian/Oklahoma Territory. (At the same time, the Dawes Commission registered members of the other Five Civilized Tribes for the same purpose. The Dawes Rolls have become important records for proving tribal membership.) Following completion of the land allotments, the US proposed to end tribal governments of the Five Civilized Tribes and admit the two territories jointly as a state. Choctaw Nation senate in 1898. Oklahoma Historical Society. The establishment of Oklahoma Territory following the Civil War was a required land cession by the Five Civilized Tribes, who had supported the Confederacy. The government used its railroad access to the Oklahoma Territory to stimulate development there. The Indian Appropriations Bill of 1889 included an amendment by Illinois Representative William McKendree Springer, that authorized President Benjamin Harrison to open the two million acres (8,000 km²) of Oklahoma Territory for settlement, resulting in the Land Run of 1889. The Choctaw Nation was overwhelmed with new settlers and could not regulate their activities. In the late 19th century, Choctaws suffered almost daily from violent crimes, murders, thefts and assaults from whites and from other Choctaws. Intense factionalism divided the traditionalistic "Nationalists" and pro-assimilation "Progressives," who fought for control. In 1905, delegates of the Five Civilized Tribes met at the Sequoyah Convention to write a constitution for an Indian-controlled state. They wanted to have Indian Territory admitted as the State of Sequoyah. Although they took a thoroughly developed proposal to Washington, DC, seeking approval, eastern states' representatives opposed it, not wanting to have two western states created in the area, as the Republicans feared that both would be Democrat-dominated, as the territories had a southern tradition of settlement. President Theodore Roosevelt, a Republican, ruled that the Oklahoma and Indian territories had to be jointly admitted as one state, Oklahoma. To achieve this, tribal governments had to end and all residents accept state government. Many of the leading Native American representatives from the Sequoyah Convention participated in the new state convention. Its constitution was based on many elements of the one developed for the State of Sequoyah. In 1906 the U.S. dissolved the governments of the Five Civilized Tribes. This action was part of continuing negotiations by Native Americans and European Americans over the best proposals for the future. The Choctaw Nation continued to protect resources not stipulated in treaty or law. On November 16, 1907, Oklahoma was admitted to the union as the 46th state. From left to right, Chief Wesley Johnson, T. B. Sullivan, Culberson Davis, James E. Arnold, and Emil John. In late January 1914, Chief Wesley Johnson and his delegates (Culbertson Davis and Emil John) traveled to Washington, D. C. ... While they were in Washington, Johnson, Davis, and John met with numerous senators & representatives and persuaded the federals to bring the Choctaw case before Congress. On February 5th, their mission culminated with the meeting of President Woodrow Wilson. Culbertson Davis presented a beaded Choctaw belt as a token of goodwill to the President. Nearly two years after the trip to Washington, the Indian Appropriations Act of May 18, 1916 was passed. A stipulation allowed $1,000 for a investigation on the Mississippi Choctaws' condition. John R. T. Reeves was to "investigate the condition of the Indians living in Mississippi and report to Congress ... as to their needs for additional land and school facilities ..." Reeves submitted his report on November 6, 1916. In March 1917, federal representatives held hearings, attended by around 100 Choctaws, to examine the needs of the Mississippi Choctaws. Some of the congressmen who presided over the hearings were: Charles D. Carter of Oklahoma, William W. Hastings of Oklahoma, Carl T. Hayden of Arizona, John N. Tillman of Arkansas, and William W. Venable of Mississippi. These hearings resulted in improvements such as improved access to health care, housing, and schools. After Cato H. Sells investigated the Choctaws' condition, the U. S. Bureau of Indian Affairs established the Choctaw Agency on October 8 of 1918. The Choctaw Agency was based in Philadelphia, Mississippi, the center of Indian activity. Dr. Frank J. McKinley was its first superintendent, and he was also the physician. Before 1916, six Indian schools operated in three counties: two in Leake, three in Neshoba, and one in Newton. The names of those schools were: Tubby Rock Indian School, Calcutta Indian School, Revenue Indian school, Red Water Indian School, and Gum Springs Indian School. The Newton Indian school's name is not known. The agency established new schools in the following Indian communities: Bogue Chitto, Bogue Homo, Conehatta, Pearl River, Red Water, Standing Pine, and Tucker. Under segregation, few schools were open to Choctaw children, whom the white southerners classified as non-whites. The Mississippi Choctaws' improvements may have continued if it wasn't dramatically interrupted by world events. World War I slowed down progress for the Indians as Washington's bureaucracy focused on the war. Some Mississippi Choctaws also served during the war. The Spanish Influenza also slowed progress as many Choctaws were killed by the world-wide epidemic. In the closing days of World War I, a group of Oklahoma Choctaws serving in the U.S. Army used their native language as the basis for secret communication among Americans, as Germans could not understand it. They are now called the Choctaw Code Talkers. The Choctaws were the Native American innovators who served as code talkers. Captain Lawrence, a company commander, overheard Solomon Louis and Mitchell Bobb conversing in the Choctaw language. He learned there were eight Choctaw men in the battalion. Fourteen Choctaw Indian men in the Army's 36th Division trained to use their language for military communications. Their communications, which could not be understood by Germans, helped the American Expeditionary Force win several key battles in the Meuse-Argonne Campaign in France, during the last big German offensive of the war. Within 24 hours after the US Army starting using the Choctaw speakers, they turned the tide of battle by controlling their communications. In less than 72 hours, the Germans were retreating and the Allies were on full attack. The 14 Choctaw Code Talkers were Albert Billy, Mitchell Bobb, Victor Brown, Ben Caterby, James Edwards, Tobias Frazer, Ben Hampton, Solomon Louis, Pete Maytubby, Jeff Nelson, Joseph Oklahombi, Robert Taylor, Calvin Wilson, and Captain Walter Veach. More than 70 years passed before the contributions of the Choctaw Code talkers were fully recognized. On November 3, 1989, in recognition of the important role the Choctaw Code Talkers played during World War I, the French government presented the Chevalier de L'Ordre National du Mérite (the Knight of the National Order of Merit) to the Choctaws Code Talkers. The US Army again used Choctaw speakers for coded language during World War II. During the Great Depression and the Roosevelt Administration, officials began numerous initiatives to alleviate some of the social and economic conditions in the South. The 1933 Special Narrative Report described the dismal state of welfare of Mississippi Choctaws, whose population by 1930 had slightly increased to 1,665 people. John Collier, the US Commissioner for Indian Affairs (now BIA), had worked for a decade on Indian affairs and been developing ideas to change federal policy. He used the report as instrumental support to re-organize the Mississippi Choctaw as the Mississippi Band of Choctaw Indians. This enabled them to establish their own tribal government, and gain a beneficial relationship with the federal government. In 1934, President Franklin Roosevelt signed into law the Indian Reorganization Act. This law proved critical for survival of the Mississippi Choctaw. Baxter York, Emmett York, and Joe Chitto worked on gaining recognition for the Choctaw. They realized that the only way to gain recognition was to adopt a constitution. A rival organization, the Mississippi Choctaw Indian Federation, opposed tribal recognition because of fears of dominance by the Bureau of Indian Affairs (BIA). They disbanded after leaders of the opposition were moved to another jurisdiction. The first Mississippi Band of Choctaw Indians tribal council members were Baxter and Emmett York with Joe Chitto as the first chairperson. With the tribe's adoption of government, in 1944 the Secretary of the Interior declared that 18,000 acres (73 km2) would be held in trust for the Choctaw of Mississippi. Lands in Neshoba and surrounding counties were set aside as a federal Indian reservation. Eight communities were included in the reservation land: Bogue Chitto, Bogue Homa, Conehatta, Crystal Ridge, Pearl River, Red Water, Tucker, and Standing Pine. Under the Indian Reorganization Act, the Mississippi Choctaws re-organized on April 20, 1945 as the Mississippi Band of Choctaw Indians. This gave them some independence from the Democratic party-dominated state government, which continued with enforcement of racial segregation and discrimination. World War II was a significant turning point for Choctaws and Native Americans in general. Although the Treaty of Dancing Rabbit Creek stated Mississippi Choctaws had U.S. citizenship, they had become associated with "colored people" as non-white in a state that had imposed racial segregation under Jim Crow laws. State services for Native Americans were non-existent. The state was poor and still dependent on agriculture. In its system of segregation, services for minorities were consistently underfunded. The state constitution and voter registration rules dating from the turn of the 20th century kept most Native Americans from voting, making them ineligible to serve on juries or to be candidates for local or state offices. They were without political representation. A Mississippi Choctaw veteran stated, "Indians were not supposed to go in the military back then ... the military was mainly for whites. My category was white instead of Indian. I don't know why they did that. Even though Indians weren't citizens of this country, couldn't register to vote, didn't have a draft card or anything, they took us anyway." Van Barfoot, a Choctaw from Mississippi, who was a sergeant and later a second lieutenant in the U.S. Army, 157th Infantry, 45th Infantry Division, received the Medal of Honor. Barfoot was commissioned a second lieutenant after he destroyed two German machine gun nests, took 17 prisoners, and disabled an enemy tank. Group of Mississippi Choctaw males in the late 50s or early 60s. Photograph by Bob Ferguson. The first Mississippi Band of Choctaw Indians regular tribal council meeting was held on July 10, 1945. The members were Joe Chitto (Chairman), J.C. Allen (Vice Chairman), Nicholas Bell (Secretary Treasurer), Tom Bell, Preatice Jackson, Dempsey Morris, Woodrow W. Jackson, Lonnie Anderson, Joseph Farve, Phillip Farve, Will Wilson, Hensley Gibson, Will Jimmie, Baxter York, Ennis Martin, and Jimpson McMillan. After World War II, pressure in Congress mounted to reduce Washington's authority on Native American lands and liquidate the government's responsibilities to them. In 1953 the House of Representatives passed Resolution 108, proposing an end to federal services for 13 tribes deemed ready to handle their own affairs. The same year, Public Law 280 transferred jurisdiction over tribal lands to state and local governments in five states. Within a decade Congress terminated federal services to more than sixty groups despite intense opposition by Indians. Congress settled on a policy to terminate tribes as quickly as possible. Out of concern for the isolation of many Native Americans in rural areas, the federal government created relocation programs to cities to try to expand their employment opportunities. Indian policy experts hoped to expedite assimilation of Native Americans to the larger American society, which was becoming urban. In 1959, the Choctaw Termination Act was passed. Unless repealed by the federal government, the Choctaw Nation of Oklahoma would effectively be terminated as a sovereign nation as of August 25, 1970. President John F. Kennedy halted further termination in 1961 and decided against implementing additional terminations. He did enact some of the last terminations in process, such as with the Ponca. Both presidents Lyndon Johnson and Richard Nixon repudiated termination of the federal government's relationship with Native American tribes. We must affirm the right of the first Americans to remain Indians while exercising their rights as Americans. We must affirm their right to freedom of choice and self-determination. We must seek new ways to provide Federal assistance to Indians-with new emphasis on Indian self-help and with respect for Indian culture. And we must assure the Indian people that it is our desire and intention that the special relationship between the Indian and his government grow and flourish. For, the first among us must be not be last. —  President Lyndon Johnson, Message to Congress "The Forgotten American", March 6, 1968. The Choctaw people continued to struggle economically due to bigotry, cultural isolation, and lack of jobs. The Choctaw, who for 150 years had been neither white nor black, were "left where they had always been"—in poverty. Will D. Campbell, a Baptist minister and Civil Rights activist, witnessed the destitution of the Choctaw. He would later write, "the thing I remember the most ... was the depressing sight of the Choctaws, their shanties along the country roads, grown men lounging on the dirt streets of their villages in demeaning idleness, sometimes drinking from a common bottle, sharing a roll-your-own cigarette, their half-clad children a picture of hurting that would never end." With reorganization and establishment of tribal government, however, over the next decades they took control of "schools, health care facilities, legal and judicial systems, and social service programs." The Choctaws witnessed the social forces that brought Freedom Summer and its after effects to their ancient homeland. The civil rights movement produced significant social change for the Choctaw in Mississippi, as their civil rights were enhanced. Prior to the Civil Rights Act of 1964, most jobs were given to whites, then blacks. Donna Ladd wrote that a Choctaw, now in her 40s, remembers "as a little girl, she thought that a 'white only' sign in a local store meant she could only order white, or vanilla, ice cream. It was a small story, but one that shows how a third race can easily get left out of the attempts for understanding." On June 21, 1964 James Chaney, Andrew Goodman, and Michael Schwerner (renowned civil rights workers) disappeared; their remains were later found in a newly constructed dam. A crucial turning point in the FBI investigation came when the charred remains of the murdered civil rights workers' station wagon was found on a Mississippi Choctaw reservation. Two Choctaw women, who were in the back seat of a deputy's patrol car, said they witnessed the meeting of two conspirators who expressed their desire to "beat-up" the boys. The end of legalized racial segregation permitted the Choctaws to participate in public institutions and facilities that had been reserved exclusively for white patrons. Phillip Martin, who had served in the U. S. Army in Europe during World War II, returned to visit his former Neshoba County, Mississippi home. After seeing the poverty of his people, he decided to stay to help. Martin served as chairperson in various Choctaw committees up until 1977. Martin was elected as Chief of the Mississippi Band of Choctaw Indians. He served a total of 30 years, being re-elected until 2007. Martin died in Jackson, Mississippi, on February 4, 2010. He was eulogized as a visionary leader, who had lifted his people out of poverty with businesses and casinos built on tribal land. In the social changes around the civil rights era, between 1965 and 1982 many Choctaw Native Americans renewed their commitments to the value of their ancient heritage. Working to celebrate their own strengths and exercise appropriate rights; they dramatically reversed the trend toward abandonment of Indian culture and tradition. During the 1960s, Community Action programs connected with Native Americans were based on citizen participation. In the 1970s, the Choctaw repudiated the extremes of Indian activism. The Oklahoma Choctaw sought a local grassroots solution to reclaim their cultural identity and sovereignty as a nation. The Mississippi Choctaw would lay the foundations of business ventures. Forced termination is wrong, in my judgment, for a number of reasons. First, the premises on which it rests are wrong ... The second reason for rejecting forced termination is that the practical results have been clearly harmful in the few instances in which termination actually has been tried ... The third argument I would make against forced termination concerns the effect it has had upon the overwhelming majority of tribes which still enjoy a special relationship with the Federal government ... The recommendations of this administration represent an historic step forward in Indian policy. We are proposing to break sharply with past approaches to Indian problems. Soon after this, Congress passed the landmark Indian Self-Determination and Education Assistance Act of 1975; this completed a 15-year period of federal policy reform with regard to American Indian tribes. The legislation authorized processes by which tribes could negotiate contracts with the BIA to manage directly more of their education and social service programs. In addition, it provided direct grants to help tribes develop plans for assuming such responsibility. It also provided for Indian parents' participation on local school boards. Norma Howard (Choctaw Nation of Oklahoma), award-winning watercolor painter, with Choctaw stickball sticks made by her son. Beginning in 1979 the Mississippi Choctaw tribal council worked on a variety of economic development initiatives, first geared toward attracting industry to the reservation. They had many people available to work, natural resources, and no state or federal taxes. Industries have included automotive parts, greeting cards, direct mail and printing, and plastic-molding. The Mississippi Band of Choctaw Indians is one of the state's largest employers, running 19 businesses and employing 7,800 people. Starting with New Hampshire in 1963, numerous state governments began to operate lotteries and other gambling in order to raise money for government services, often promoting the programs by promising to earmark revenues to fund education, for instance. In 1987 the Supreme Court of the United States ruled that federally recognized tribes could operate gaming facilities on reservations, as this was sovereign territory, and be free from state regulation. As tribes began to develop gaming, starting with bingo, in 1988 the U.S. Congress enacted the Indian Gaming Regulatory Act (IGRA). It set the broad terms for Native American tribes to operate casinos, requiring that they do so only in states that had already authorized private gaming. Since then development of casino gaming has been one of the chief sources for many tribes of new revenues. The Choctaw Nation of Oklahoma developed gaming operations and a related resort: the Choctaw Casino Resort and Choctaw Casino Bingo are their popular gaming destinations in Durant. Located near the Oklahoma-Texas border, these sites attract residents of Southern Oklahoma and North Texas. The largest regional population base from which they draw is the Dallas-Fort Worth Metroplex. The Mississippi Band of Choctaw Indians (MBCI) unsuccessfully sought state agreement to develop gaming under the Ray Mabus administration. But in 1992 Mississippi Governor Kirk Fordice gave permission for the MBCI to develop Class III gaming. They have developed one of the largest casino resorts in the nation; it is located in Philadelphia, Mississippi near the Pearl River. The Silver Star Casino opened its doors in 1994. The Golden Moon Casino opened in 2002. The casinos are collectively known as the Pearl River Resort. After nearly two hundred years, the Choctaw have regained control of the ancient sacred site of Nanih Waiya. Mississippi protected the site for years as a state park. In 2006, the state legislature passed a bill to return Nanih Waiya to the Choctaw. In the second half of the 1990s, lobbyist Jack Abramoff was employed by Preston Gates Ellis & Rouvelas Meeds LLP, the lobbying arm in Washington, DC of the Preston Gates & Ellis LLP law firm based in Seattle, Washington. In 1995, Abramoff began representing Native American tribes who wanted to develop gambling casinos, starting with the Mississippi Band of Choctaw Indians. The Choctaw originally had lobbied the federal government directly, but beginning in 1994, they found that many of the congressional members who had responded to their issues had either retired or were defeated in the "Republican Revolution" of the 1994 elections. Nell Rogers, the tribe's specialist on legislative affairs, had a friend who was familiar with the work of Abramoff and his father as Republican activists. The tribe contacted Preston Gates, and soon after hired the firm and Abramoff. Abramoff succeeded in gaining defeat of a Congressional bill to use the unrelated business income tax (UBIT) to tax Native American casinos; it was sponsored by Reps. Bill Archer (R-TX) and Ernest Istook (R-OK). Since the matter involved taxation, Abramoff enlisted help from Grover Norquist, a Republican acquaintance from college, and his Americans for Tax Reform (ATR). The bill was eventually defeated in 1996 in the Senate, due in part to grassroots work by ATR. The Choctaw paid $60,000 in fees to Abramoff. According to Washington Business Forward, a lobbying trade magazine, Senator Tom DeLay was also a major figure in achieving defeat of the bill. The fight strengthened Abramoff's alliance with him. Purporting to represent Native Americans before Congress and state governments in the developing field of gaming, Jack Abramoff and Michael Scanlon used fraudulent means to gain profits of $15 million in total payments from the Mississippi Band of Choctaw Indians. After Congressional oversight hearings were held in 2004 on the lobbyists' activities, federal criminal charges were brought against Abramoff and Scanlon. In an e-mail sent January 29, 2002, Abramoff had written to Scanlon, "I have to meet with the monkeys from the Choctaw tribal council." On January 3, 2006, Abramoff pleaded guilty to three felony counts: conspiracy, fraud, and tax evasion. The charges were based principally on his lobbying activities in Washington on behalf of Native American tribes. In addition, Abramoff and other defendants must make restitution of at least $25 million that was defrauded from clients, most notably the Native American tribes. In July 2011, agents from the FBI "seized" Pearl River Resort informational assets. The Los Angeles Times reported that the Indians are "faced with infighting over a disputed election for tribal chief and an FBI investigation targeting the tribe's casinos." The MOWA Choctaw reside on a 600-acre reservation in southwestern Alabama with a total enrolled population of 3,600 (total population over 10,000). The tribe has the last Indian school in Alabama named Calcedeaver in Mount Vernon, Mobile County, Alabama. The Senate Select Committee on Indian Affairs voted 11–2 in support of federal recognition for the MOWA Choctaw. To date the tribe has had 12 Congressional Bills, 3 appeals through the office of federal acknowledgement, and a federal lawsuit directed at its efforts for federal recognition. Federal recognition is not a pre-requisite to accord a tribe sovereign immunity, according to John. S. Bottomly v Passamaquoddy Tribe et al. 595 F.2d 1061 (1st Cir. 1979). In Bottomly, the United States Supreme Court held that the availability of sovereign immunity is not conditioned on formal federal recognition of a particular tribe. Therefore a tribe, its chief, nor its tribal officials do not need to prove that it has been federally recognized in order to assert immunity from suit for acts done in their official tribal capacity. Tullockchishko (Drinks the Juice of the Stones) was the greatest of Choctaw stickball players, 1834. The Choctaw people are believed to have coalesced in the 17th century, perhaps from peoples from Alabama and the Plaquemine culture. Their culture continued to evolve in the Southeast. The Choctaw practiced Head flattening as a ritual adornment for its people, but the practice eventually fell out of favor. Some of their communities had extensive trade and interaction with Europeans, including people from Spain, France, and England greatly shaped it as well. After the United States was formed and its settlers began to move into the Southeast, the Choctaw were among the Five Civilized Tribes, who adopted some of their ways. They transitioned to yeoman farming methods, and accepted European Americans and African Americans into their society. In mid-summer, the Mississippi Band of Choctaw Indians celebrate their traditional culture during the Choctaw Indian Fair with ball games, dancing, cooking and entertainment. Choctaw stickball, the oldest field sport in North America, was also known as the "little brother of war" because of its roughness and substitution for war. When disputes arose between Choctaw communities, stickball provided a civil way to settle issues. The stickball games would involve as few as twenty or as many as 300 players. The goal posts could be from a few hundred feet apart to a few miles. Goal posts were sometimes located within each opposing team's village. A Jesuit priest referenced stickball in 1729, and George Catlin painted the subject. The Mississippi Band of Choctaw Indians continue to practice the sport. Other games included using corn, cane, and moccasins. The corn game used five to seven kernels of corn. One side was blackened and the other side white. Players won points based on each color. One point was awarded for the black side and 5–7 points for the white side. There were usually only two players. Chata Anumpa: Hattak yuka keyu hokυtto yakohmit itibachυfat hieli kυt, nan isht imaiυlhpiesa atokmυt itilawashke; yohmi ha hattak nana hohkia, keyukmυt kanohmi hohkia okla moma nana isht aim aiυlhpiesa, micha isht aimaiυlhtoba he aima ka kanohmi bano hosh isht ik imaiυlhpieso kashke. Amba moma kυt nana isht imachukma chi ho tuksυli hokmakashke. English Language: That all free men, when they form a special compact, are equal in rights, and that no man or set of men are entitled to exclusive, separate public emolument or privileges from the community, but in consideration of public services. The word nanpisa (the one who sees) expressed the reverence the Choctaw had for the sun. Anthropologist theorize that the Mississippian ancestors of the Choctaw placed the sun at the center of their cosmological system. Mid-eighteenth-century Choctaws did view the sun as a being endowed with life. Choctaw diplomats, for example, spoke only on sunny days. If the day of a conference were cloudy or rainy, Choctaws delayed the meeting until the sun returned, usually on the pretext that they needed more time to discuss particulars. They believed the sun made sure that all talks were honest. The sun as a symbol of great power and reverence is a major component of southeastern Indian cultures. Choctaw prophets were known to have addressed the sun. John Swanton wrote, "an old Choctaw informed Wright that before the arrival of the missionaries, they had no conception of prayer. He added, "I have indeed heard it asserted by some, that anciently their hopaii, or prophets, on some occasions were accustomed to address the sun ..."
The colorful dresses worn by today's Choctaw are made by hand. They are based on designs of their ancestors, who adapted 19th-century European-American styles to their needs. Today many Choctaw wear such traditional clothing mainly for special events. Choctaw elders, especially the women, dress in their traditional garb every day. Choctaw dresses are trimmed by full diamond, half diamond or circle, and crosses that represent stickball sticks. Early Choctaw communities worked communally and shared their harvest. They had trouble understanding why English settlers allowed their poor to suffer from hunger. In Ireland, the generosity of the Choctaw nation during their Great Famine in the mid-nineteenth century is remembered to this day and recently marked by a sculpture, 'Kindred Spirits', in a park at Midleton, Cork. The complete Choctaw Nation shaded in blue in relation to the U.S. state of Mississippi. Land was the most valuable asset, which the Native Americans held in collective stewardship. The United States systematically obtained Choctaw land for conventional European-American settlement through treaties, legislation, and threats of warfare. Although the Choctaw made treaties with Great Britain, France, Spain, and the Confederate States of America; the nation signed only nine treaties with the United States. Some treaties which the US made with other nations, such as the Treaty of San Lorenzo, indirectly affected the Choctaw. Reservations can be found in Alabama-(MOWA Band of Choctaw Indians), Louisiana-(Jena Band of Choctaw Indians; United Houma Nation; Choctaw-Apache Tribe of Ebarb; Bayou Lacombe Choctaw; Clifton Choctaw), Texas-(Mount Tabor Indian Community), Mississippi-(Mississippi Band of Choctaw Indians), and Oklahoma-(Choctaw Nation of Oklahoma). Other population centers include California, Oregon, Dallas, Houston and Chicago. The Oklahoma reservation, is defined by treaty. Tuscaloosa (died October 1540) retaliated against Hernando de Soto at the Battle of Mabilia. The battle was the first major conflict in North America between Native Americans and Europeans. Franchimastabe (died 19th century) was a transitional benefactor and a contemporary of Taboca. To some Americans he was the "leading chief of the Choctaws." He led a war party with British forces against American rebels. 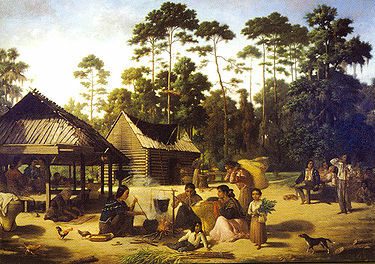 Franchasmatabe attended the treaty talks of 1801 near Mobile, Alabama. Taboca (died 19th century) was a traditional "prophet-chief" who led a delegation starting in October 1785 to Hopewell, South Carolina. Apuckshunubbee (c. 1740–1824) was chief of the Okla Falaya (Tall People) district in old Choctaw nation. He died in Kentucky on his way to Washington D.C. to conduct negotiations. Pushmataha (Apushmataha) (1760s–December 24, 1824) was a chief in old Choctaw nation. He negotiated treaties with the United States and fought on the American's side in the War of 1812. He died in Washington D.C. and is buried in the Congressional Cemetery in Washington D.C.
Mosholatubbee (1770–1836) was a chief in the Choctaw nation before the removal and after. He went to Washington City to negotiate for the tribe in 1824 and was the only major leader to return. In the summer of 1830, he ran for a seat in the Congress of the United States to represent the state of Mississippi. Greenwood LeFlore (June 3, 1800 – August 31, 1865) was a District Chief of the Choctaws in Mississippi. He was an influential state representative and senator in Mississippi. 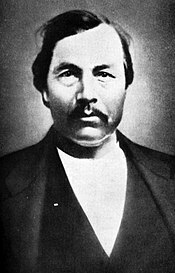 George W. Harkins (1810–1890) was a district Choctaw chief in Indian Territory (1850–1857) prior to the Civil War and author of the "Farewell Letter to the American People". Peter Pitchlynn (January 30, 1806 – January 17, 1881) was a highly influential leader during the removal era and long after. He represented the Choctaws in Washington D.C. for some years and is buried in the Congressional Cemetery. Charles Dickens described him "as stately and complete a gentleman of nature's making as ever I beheld." Wesley Johnson (c. 1849 – 1925) was elected chief on May 10, 1913 in Meridian, Mississippi. He would lead the Mississippi, Alabama, and Louisiana Choctaw Council's delegation to Washington, D. C. in February 1914 where he met President Woodrow Wilson and many members of congress. There he expressed the dire situation of the Mississippi Choctaws. Wesley Johnson represented the Alabama Delegation from Southwest Alabama in Mobile and Washington Counties. Wesley Johnson was also known as Wesley Wakatubee. Phillip Martin (March 13, 1926 – February 4, 2010) was the Chief of the Mississippi Band of Choctaw Indians from 1979 to 2007 and worked in tribal government for over fifty years. He encouraged outside investment and reduced unemployment to nearly 0% on the reservation. 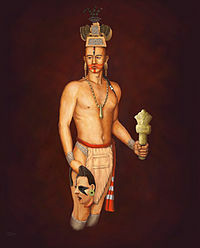 Wikimedia Commons has media related to Choctaw. ^ Common misspellings and variations in other languages include Chacta, Tchakta and Chocktaw. ^ "American Indian, Alaska Native Tables from the Statistical Abstract of the United States" (PDF). Statistical Abstract of the United States: 2004–2005. US Census Bureau (124th ed). Archived from the original (PDF) on 2005-02-11. Retrieved 2007-09-20. ^ Swanton, John R. (2001) . Source Material for the Social and Ceremonial Life of the Choctaw Indians. The University of Alabama Press. p. 29. ISBN 978-0-8173-1109-4. ^ O'Brien, Greg (2005) . "The Multiethnic Confederacy". Choctaws in a Revolutionary Age, 1750–1830. University of Nebraska Press. p. 21. ISBN 978-0-8032-8622-1. ^ Zinn, Howard (2003). "As Long as Grass Grows or Water Runs". A People's History of the United States: 1492–Present. HarperCollins. p. 126. ISBN 978-0-06-052842-3. ^ PBS (2007). "Andrew Jackson: Good, Evil & the Presidency". PBS. Retrieved 2009-08-25. ^ Horsman, Reginald (1981). "Racial Destiny and the Indians". Race and Manifest Destiny: The Origins of American Racial Anglo-Saxonism. Harvard University Press. p. 200. ISBN 978-0-674-94805-1. ^ a b c Kappler, Charles (1904). "INDIAN AFFAIRS: LAWS AND TREATIES Vol. II, Treaties". Government Printing Office. Retrieved 2008-02-19. ^ a b c Baird, David (1973). "The Choctaws Meet the Americans, 1783 to 1843". The Choctaw People. United States: Indian Tribal Series. p. 36. LCCN 73-80708. ^ a b Council of Indian Nations (2005). "History & Culture, Citizenship Act – 1924". Council of Indian Nations. Retrieved 2008-05-02. ^ a b c Prentice, Guy (2003). "Pushmataha, Choctaw Indian Chief". Southeast Chronicles. Retrieved 2008-02-11. ^ a b c d Cushman, Horatio (1999) . "The Chickasaw". History of the Choctaw, Chickasaw and Natchez Indians. University of Oklahoma Press. p. 364. ISBN 978-0-8061-3127-6. ^ Cushman, Horatio (1999) . "The Choctaw". History of the Choctaw, Chickasaw and Natchez Indians. University of Oklahoma Press. p. 151. ISBN 978-0-8061-3127-6. ^ About North Georgia (1994–2006). "Moundbuilders, North Georgia's early inhabitants". Golden Ink. Retrieved 2008-05-02. ^ Morison, Samuel (1974). The European Discovery of America, The Southern Voyages. Oxford University Press. p. 507. ISBN 978-0-19-504222-1. ^ Weber, David (1992). The Spanish Frontier in North America. Yale University Press. pp. 36–37. ASIN B000OROPBY. ^ a b c d Galloway, Patricia (1995). Choctaw Genesis, 1500–1700 (Indians of the Southeast). University of Nebraska Press. ISBN 978-0-8032-7070-1. ^ Swanton, John (2001) . Source Material for the Social and Ceremonial Life of the Choctaw Indians. The University of Alabama Press. pp. 5–37. ISBN 978-0-8173-1109-4. ^ Romans, Bernard (1776) . A Concise Natural History of East and West Florida. New York, R. Aitken, Bookselleer. p. 71. ^ Catlin, George (1903) . North American Indians. John Grant. p. 128. ^ Gentleman of Elvas (1557). "Chapter II, How Cabeza de Vaca arrived at court". Narratives of the Career of Hernando de Soto in the Conquest of Florida as told by a Knight of Elvas. Kallman Publishing Co. (1968), Translated by Buckingham Smith. ASIN B000J4W27Q. ^ Duncan, David (1995). "Foreword". Hernando de Soto. Crown Publishers, Inc. p. xxi. ISBN 978-0-517-58222-0. ^ a b c d Brescia, William (Bill) (1982). "Chapter 2, French-Choctaw Contact, 1680s–1763". Tribal Government, A New Era. Philadelphia, Mississippi: Choctaw Heritage Press. p. 8. ^ Usner, Jr., Daniel H. (1992). "Trade and Settlement". Indians, Settlers, & Slaves in a Frontier Exchange Economy. The University of North Carolina Press. p. 31. ISBN 978-0-8078-4358-1. ^ "Define Choctaw | Dictionary and Thesaurus". choctaw.askdefine.com. Retrieved 2018-09-12. ^ Sweet, David G.; Nash, Gary B. (1982). Struggle and Survival in Colonial America (illustrated ed.). University of California Press. ISBN 978-0-520-04501-9. ^ a b O'Brien, Greg (30 April 2008). Pre-removal Choctaw History: Exploring New Paths. University of Oklahoma Press. pp. 123–126. ISBN 978-0-8061-3916-6. Retrieved 25 March 2011. ^ a b Ferguson, Bob; Marshall, Leigh (1997). "Chronology". Mississippi Band of Choctaw Indians. Archived from the original on 2007-10-10. Retrieved 2008-02-05. ^ Sword, Wiley (1985). President Washington's Indian War: The Struggle for the Old Northwest, 1790-1795. Norman, OK: University of Oklahoma Press. pp. 269–71. ISBN 9780806124889. ^ a b Perdue, Theda (2003). "Chapter 2 "Both White and Red"". Mixed Blood Indians: Racial Construction in the Early South. The University of Georgia Press. p. 51. ISBN 978-0-8203-2731-0. ^ Remini, Robert (1998) . ""The Reform Begins"". Andrew Jackson. History Book Club. p. 201. ISBN 0-9650631-0-7. ^ Remini, Robert (1998) . ""Brothers, Listen ... You Must Submit"". Andrew Jackson. History Book Club. p. 258. ISBN 0-9650631-0-7. ^ Miller, Eric (1994). "George Washington And Indians: Washington and the Northwest War, Part One". Retrieved 2015-02-25. ^ "By the President of the United States of America. A proclamation". Yale Law School. 1790. Retrieved 2010-08-11. ^ Brescia, William "Bill" (1982). "Appendix 1". Choctaw Tribal Government: A New Era. Choctaw Heritage Press, Mississippi Band of Choctaw Indians. ^ O'Brien, Greg (2005) . "Power Derived from the Outside World". Choctaws in a Revolutionary Age, 1750–1830. University of Nebraska Press. p. 50. ISBN 978-0-8032-8622-1. ^ O'Brien, Greg (2005) . "Power Derived from the Outside World". Choctaws in a Revolutionary Age, 1750–1830. University of Nebraska Press. p. 58. ISBN 978-0-8032-8622-1. ^ a b c d O'Brien, Greg (2005) . "Choctaw and Power". Choctaws in a Revolutionary Age, 1750–1830. University of Nebraska Press. pp. 60–61. ^ a b Indian Affairs: Laws and Treaties (Text of the 1786 Choctaw Treaty). ^ "Removal". Toli at UGA: the Flying Rats. Archived from the original on 2009-02-02. Retrieved 2008-02-19. ^ Swanton, John R. (2001) . Source Material for the Social and Ceremonial Life of the Choctaw Indians. The University of Alabama Press. p. 4. ISBN 978-0-8173-1109-4. ^ a b Jones, Charlie; Bouch, Mike (November 1987). "Sharing Choctaw History". Bishinik. University of Minnesota. Archived from the original on 2008-06-04. Retrieved 2008-02-05. ^ Turner III, Frederick (1978) . "Poetry and Oratory". The Portable North American Indian Reader. Penguin Book. pp. 246–247. ISBN 978-0-14-015077-3. ^ Junaluska, Arthur; Vine Deloria, Jr. (1976). "Chief Pushmataha – Response to Tecumseh" (mp3). Great American Indian Speeches, Vol. 1 (Phonographic Disc). Caedmon. Retrieved 2006-11-29. ^ Guerin, Russell B.; Giardino, Marco (6 June 2010). "The Favre Family in Early Hancock County, MS". russguerin.com. Archived from the original on 2013-07-28. Retrieved 25 December 2012. ^ Lincecum, Gideon (1906). Life of Apushimataha. Mississippi Historical Society Publications 9: 415–485. ASIN B0008AQ48Y. ^ a b Lossing, Benson J. (1869). "XXXIV: War Against the Creek Indians.". Pictorial Field-Book of the War of 1812. New York: Harper & Brothers. ISBN 978-0-7812-3860-1. Retrieved 2006-11-30. ^ Upton, David (2003-11-22). "Soldiers of the Mississippi Territory". David Upton. Archived from the original on 2008-07-31. Retrieved 2008-05-02. ^ Access Genealogy Indian Tribal Records. "Pushmataha, Choctaw Indian Chief". Access Genealogy. Retrieved 2008-02-25. ^ "Choctaw recruits fight with the U.S. Army (U.S. National Park Service)". www.nps.gov. Retrieved 2019-03-27. ^ "The Battle of New Orleans". WCNY. 2013-06-12. Retrieved 2019-03-27. ^ Cushman, Horatio (1999) . "The Choctaw". History of the Choctaw, Chickasaw and Natchez Indians. University of Oklahoma Press. p. 60. ISBN 978-0-8061-3127-6. ^ a b Remini, Robert (1998) . "Expansion and Removal". Andrew Jackson. History Book Club. p. 395. ISBN 0-9650631-0-6. ^ a b Cushman, Horatio (1999) . "The Choctaw". History of the Choctaw, Chickasaw and Natchez Indians. University of Oklahoma Press. p. 67. ISBN 978-0-8061-3127-6. ^ D. L. Birchfield. "Choctaws". Retrieved 2008-05-07. ^ White, Earl. "Choctaw Nation of Oklahoma". Choctaw Nation of Oklahoma. Archived from the original on September 13, 2009. Retrieved 2008-02-25. ^ Clarke, Hewitt (1995) . "Chapter 1, "The Death of Koosa Town"". Thunder at Meridian. Lone Star Press. pp. 51–52. ISBN 978-0-9649231-0-2. ^ "CONTENTdm". Archived from the original on 2016-04-29. Retrieved 2016-04-26. ^ a b Sharyn Kane & Richard Keeton. "Fort Benning – The Land and the People: As Long as Grass Grows". SEAC. Archived from the original on 22 March 2009. Retrieved 2010-08-07. ^ Remini, Robert (1998) . ""Brothers, Listen ... You Must Submit"". Andrew Jackson. History Book Club. p. 272. ISBN 0-9650631-0-7. ^ Green, Len (October 1978). "Choctaw Treaties". Bishinik. Archived from the original on 2007-12-15. Retrieved 2008-03-21. ^ a b c Remini, Robert (1998) . ""Brothers, Listen ... You Must Submit"". Andrew Jackson. History Book Club. ISBN 0-9650631-0-7. ^ Carleton, Ken (2002). "A Brief History of the Mississippi Band of Choctaw Indians" (PDF). Mississippi Archaeological Association. Retrieved 2009-05-04. ^ a b Remini, Robert (1998) . ""Brothers, Listen ... You Must Submit"". Andrew Jackson. History Book Club. p. 273. ^ Satz, Ronald (1986) . "The Mississippi Choctaw: From the Removal Treaty of the Federal Agency". In Samuel J. Wells and Roseanna Tuby (ed.). After Removal: The Choctaw in Mississippi. University Press of Mississippi. p. 7. ISBN 978-0-87805-289-9. ^ Harkins, George (1831). "1831 – December – George W. Harkins to the American People". Archived from the original on 2006-05-27. Retrieved 2008-02-13. ^ de Tocqueville, Alexis (1835–1840). "Tocqueville and Beaumont on Race". Retrieved 2008-04-28. ^ Chronicles of Oklahoma, Edward Davis. "The Mississippi Choctaws". Retrieved 2011-04-19. ^ DeRosier, Arthur (1970). "Ward reportedly registered some 1,300 Choctaws as citizens out of token compliance.". The Removal of the Choctaw Indians. the University of Tennessee Press Knoxville. p. 135. ISBN 978-087049-113-9. ^ Hudson, Charles (1971). "The Ante-Bellum Elite". Red, White, and Black; Symposium on Indians in the Old South. University of Georgia Press. p. 80. ISBN 978-0820303086. ^ a b c d e f Swanton, John (2001) . "Choctaw Social and Ceremonial Life". Source Material for the Social and Ceremonial Life of the Choctaw Indians. The University of Alabama Press. p. 5. ISBN 978-0-8173-1109-4. ^ "Col. William Wards Register". National Archives, Microfilm Roll #170 and American State Papers, Volume 8, Public lands, Page 689. Archived from the original on 2013-01-20. Retrieved 2011-04-18. ^ Encyclopedia of Oklahoma History and Culture. "Malmaison, Palace in a Wilderness, Home of General LeFlore". Retrieved 2008-09-08. ^ Adams, Nehemiah (1870-01-01). The Life of John Eliot. publisher not identified. ^ Ward, Mike (1992). "Irish Repay Choctaw Famine Gift: March Traces Trail of Tears in Trek for Somalian Relief". American-Statesman Capitol. Archived from the original on 2007-10-25. Retrieved 2007-09-20. ^ "President of Ireland Mary Robinson Addresses the Choctaw People". Archived from the original on 2011-08-10. Retrieved 2011-04-18. ^ "Choctaw Native Americans honoured for famine aid". Rte.ie. 2017-06-18. ^ "Varadkar announces scholarship for Choctaw students". ^ a b c Chronicles of Oklahoma, Edward Davis. "The Mississippi Choctaws". Retrieved 2009-02-20. ^ a b c Hudson, Charles (1976). "A Conquered People". The Southeastern Indians. The University of Tennessee Press. p. 490. ^ "Choctaws Indians for the Crystal Palace". New-York Daily Times. June 8, 1853. ^ "The Choctaw Indians". The Brooklyn Daily Eagle. July 29, 1853. ^ "Choctaw Indians". New-York Daily Times. August 19, 1853. ^ a b Encyclopedia of Oklahoma History and Culture. "Choctaw". Archived from the original on 2008-10-09. Retrieved 2008-08-11. ^ a b c Ferguson, Robert. "Southeastern Indians During The Civil War". The Backwoodsman. Vol. 39 no. 2 (Mar/Apr 2018 ed.). Bandera, Texas: Charlie Richie Sr. pp. 63–65. Retrieved February 19, 2018. ^ Boggan, Greg (2005-02-06). "The Chunky Creek Train Wreck of 1863". Retrieved 2008-02-08. ^ a b Kidwell, Clara (1995). "The Choctaws in Mississippi after 1830". Choctaws and Missionaries in Mississippi, 1818–1918. University of Oklahoma. p. 170. ISBN 978-0-8061-2691-3. ^ a b Matte, Jacqueline (2002) . "Refugees- Six Towns Choctaw, 1830–1890". They Say the Wind is Red. New South Books. p. 65. ISBN 978-1-58838-079-1. ^ Spann, S. G. (December 1905). "Choctaw Indians As Confederate Soldiers". Confederate Veteran Magazine. 13 (12): 560–561. Archived from the original on 2007-10-25. Retrieved 2008-02-06. ^ James H. Howard; Victoria Lindsay Levine (1990). "Chapter 1, Historical Background". Choctaw Music and Dance. The University of Oklahoma Press. p. 4. ^ Day, Richard H. (1967). "The Economics of Technological Change and the Demise of the Sharecropper". The American Economic Review. 57 (3): 427–449. JSTOR 1812112. ^ a b c d "The Choctaw Freedmen of Oklahoma". Retrieved 2008-02-14. ^ "1885 Choctaw & Chickasaw Freedmen Admitted To Citizenship". Retrieved 2008-03-18. ^ Mihesuah, Devon Abbott (2009). Choctaw Crime and Punishment, 1884–1907. ^ Kidwell, Clara Sue (1986). "The Mississippi Choctaw: From the Removal Treaty of the Federal Agency". In Samuel J. Wells and Roseanna Tubby (ed.). After Removal: The Choctaw in Mississippi. University Press of Mississippi. p. 87. ISBN 978-0-87805-289-9. ^ Kidwell, Clara (1995). "The Choctaws in Mississippi after 1830". Choctaws and Missionaries in Mississippi, 1818–1918. University of Oklahoma. p. 192. ISBN 978-0-8061-2691-3. ^ "Local News". The Carthaginian. April 24, 1913. ^ "Choctaw Indians Have Council Here". The Meridian Evening Star. May 10, 1913. ^ a b "Indian Conference Memoralizes U. S. Government for Monies". The Meridian Sunday Star. May 11, 1913. ^ a b c d Ferguson, Robert Bruce (2015). "Wesley Johnson, The First Modern Mississippi Choctaw Chief". Whispering Wind. Vol. 43 no. 5. Written Heritage, Inc. pp. 10–13. ^ Kidwell, Clara (1995). "The Choctaws in Mississippi after 1830". Choctaws and Missionaries in Mississippi, 1818–1918. University of Oklahoma. p. 193. ISBN 978-0-8061-2691-3. ^ Lobert, Edith (February 9, 1914). "Urge Justice For Mississippi Indians". The Washington Times. ^ "President Has Busy Day With Callers". The Washington Times. February 5, 1914. ^ a b c d John R. T. Reeves (November 6, 1916). Additional Land and Indian Schools in Mississippi. Letter from the Secretary of the Interior, Transmitting Report of John T. Reeves, Special Supervisor, Indian Service, on Need of Additional Land and School Facilities for the Indians Living in the State of Mississippi (Report). Department of the Interior, U. S. Government. ^ "Venable Urges Choctaws To Meet Committee". The Union Appeal. March 15, 1917. ^ a b "Congressional Committee Investigate Indians". The Union Appeal. March 22, 1917. ^ Martin, Phillip (2009). "A Brief History of the Choctaw Nation in Mississippi". In Lynne Jeter and Kendall Blanchard (ed.). Chief, The Autobiography of Chief Phillip Martin, Longtime Tribal Leader, Mississippi Band of Choctaw Indians. Quail Ridge Press. pp. 1, 19–20. ISBN 978-1-934193-29-7. ^ Adams, Mikaëla M. (2016). "Learning the Language of "Blood": The Mississippi Band of Choctaw Indians". Who Belongs? Race, Resources, and Tribal Citizenship in the Native South. Oxford University Press. p. 127. ISBN 9780190619466. ^ a b Sniffen, M. K. (November 1922). "The Mississippi Choctaw". The Southern Workman. LI: 505. ^ a b "Choctaw Indian Code Talkers of World War I" (notes/letters), Phillip Allen, Oklahoma University, 2000, webpage: CodeTalkers Archived October 22, 2007, at the Wayback Machine. ^ "Germans Confused by Choctaw Code Talkers" (article), BISHINIK, August 1986: 2. ^ "Native Words, Native Warriors". Retrieved 2008-03-24. ^ a b "Choctaw Code Talkers of World War II". Archived from the original on 2008-05-09. Retrieved 2008-02-13. ^ "WORLD WAR I AND II CHOCTAW CODE TALKERS". Archived from the original on 2003-08-02. Retrieved 2008-02-13. ^ Winterman, Denise (2014-05-19). "World War One: The original code talkers". BBC News. Retrieved 2017-01-25. ^ a b c d Brescia, William (Bill) (1982). "Chapter 3, Treaties and the Choctaw People". Tribal Government, A New Era. Philadelphia, Mississippi: Choctaw Heritage Press. pp. 21–22. ^ Williams, Rudi (2002). "Indians Fight America's Wars Because 'This is Our Country, Too,' Choctaw Says". Department of Defense. Archived from the original on 2008-12-02. Retrieved 2008-02-08. ^ United States Army Center of Military History (2009). "Medal of Honor Recipients, World War II (A-F)". U.S. Army. Retrieved 2009-03-06. ^ a b "U.S. House of Representatives Resolution 108, 83rd Congress, 1953. (U.S. Statutes at Large, 67: B132.)". Digital History. Archived from the original on 2007-06-08. Retrieved 2008-05-02. ^ "Johnson's Message to Congress "The Forgotten American"" (PDF). www.bobsuniverse.com. March 6, 1968. Archived from the original (PDF) on July 24, 2011. Retrieved 2015-12-10. ^ a b c d Campbell, Will (1992) . "Chapter 13". Providence. Atlanta, Georgia: Long Street Press. p. 243. ISBN 978-1-56352-024-2. ^ a b Ladd, Donna (2005-06-22). "After Killen: What's Next For Mississippi?". Jackson Free Press. Archived from the original on 2007-03-09. Retrieved 2008-02-08. ^ Mitchell, Jerry (December 2, 2007). "Six living suspects from 1964 civil rights murders". Clarion Ledger. Retrieved 2008-02-08. ^ Howard, James H.; Levine, Victoria Lindsay (1990). "Introduction". Choctaw Music and Dance. The University of Oklahoma Press. xxi. ^ "President Nixon, Special Message on Indian Affairs" (PDF). U.S. Environmental Protection Agency. Retrieved 2008-03-19. ^ ""Gimme Five"—Investigation of Tribal Lobbying Matters" (PDF). Senate Committee on Indian Affairs. 2006-06-22. Archived from the original (PDF) on 2006-06-28. Retrieved 2008-05-02. ^ U.S. Congress – Committee on Indian Affairs (2004-09-29). "Oversight Hearing In re Tribal Lobbying Matters, et al" (PDF). U.S. Senate. Archived from the original (PDF) on 2007-12-01. Retrieved 2008-02-08. ^ Holmes, Baxter (September 4, 2011). "In this war, it's Indian versus Indian". Los Angeles Times. Retrieved July 3, 2017. ^ "Choctaw Indian Fair". Information.com. Retrieved 2010-09-01. ^ Mieirs, Jennifer. "Choctaw Clans, and the People". Archived from the original on July 12, 2011. Retrieved 2010-08-16. ^ a b c Swanton, John R. (2001) . "Clans and Local Groups". Source material for the social and ceremonial life of the Choctaw Indians. University of Alabama Press. p. 79. ISBN 978-0-8173-1109-4. Retrieved 2010-08-16. ^ a b Swanton, John Reed (2001) . Source Material for the Social and Ceremonial Life of the Choctaw Indians. The University of Alabama Press. pp. 158–160. ISBN 978-0-8173-1109-4. ^ A Living Tradition: An Overview of Choctaw Cultural Arts. Mississippi Band of Choctaw Indians. 2006. p. 5. ^ a b "Choctaw Language Alphabet and Pronunciation". 1998–2008. Retrieved 2008-05-01. ^ Swanton, John R. (2001) . Source Material for the Social and Ceremonial Life of the Choctaw Indians. The University of Alabama Press. pp. 194–196. ISBN 978-0-8173-1109-4. ^ "Traditional Choctaw Dress". Choctaw website. 2004. Retrieved 2008-05-04. ^ Carolyn Reeves (2014). The Choctaw Before Removal. University of Mississippi Press. p. 57. ISBN 9781604736991. ^ "Economic Development history". Mississippi Band of Choctaw Indians. 2013. ^ Ronald Takaki (1993). A Different Mirror: A History of Multicultural America. Little, Brown and Co. p. 89. ^ "BBC News". 2017-06-18. Retrieved 9 March 2018. ^ "The Choctaw-Irish Bond Lives On". 30 March 2016. Retrieved 11 March 2018. ^ Ferguson, Bob (2001). "Treaties". Mississippi Band of Choctaw Indians. Retrieved 2008-02-06. Akers, Donna L. Living in the Land of Death: The Choctaw Nation, 1830–1860, Lansing: Michigan State University, 2004. Barnett Jr., James F. Mississippi's American Indians. Jackson, MS: University Press of Mississippi, 2012. Bartram, William. Travels Through...Country of the Chactaws..., Florida: printed by James & Johnson, 1791. Belue, Ted F. (1996). The Long Hunt: Death of the Buffalo East of the Mississippi. ISBN 978-0-8117-0968-2. Bushnell, David I. Smithsonian Institution Bureau of American Ethnology Bulletin 48: The Choctaw of Bayou Lacomb, St. Tammany Parish, Louisiana. Washington, DC: Government Printing Office, 1909. Byington, Cyrus. Smithsonian Institution Bureau of American Ethnology Bulletin 46: A Dictionary of the Choctaw Language. Washington, DC: Government Printing Office, 1915. Cushman, Horatio Bardwell; Debo, Angie (1962). The History of the Choctaw, Chickasaw, and Natchez Indians. ISBN 978-0-8061-3127-6. Gallay, Alan (2002). The Indian Slave Trade: The Rise of the English Empire in the American South, 1670–1717. ISBN 978-0-300-10193-5. Galloway, Patricia (1998-02-01). Choctaw Genesis, 1500–1700: 1500–1700. University of Nebraska Press. ISBN 978-0-8032-7070-1. Haag, Marcia; Willis, Henry (2001). 2Choctaw Language & Culture: Chahta Anumpa. Norman, Okla: University of Oklahoma Press. Hurley, Patrick J.(1883). National Atty. for Choctaw Nation "Choctaw Citizenship Litigation. Kidwell, Clara Sue. Choctaws and Missionaries in Mississippi, 1818–1918. University of Oklahoma Press: Norman and London, 1995. Kidwell, Clara Sue. The Choctaws in Oklahoma: From Tribe to Nation, 1855–1970 2007. Lambert, Valerie. Choctaw Nation: A Story of American Indian Resurgence. U. of Nebraska Press, 2007. Lincecum, Gideon. Pushmataha: A Choctaw Leader and His People. Tuscaloosa: University of Alabama Press, 2004. Lincecum, Gideon. Traditional History of the Chahta Nation, Translated from the Chahta by Gideon Lincecum, 1861. University of Texas Library, March 1932. Morrison, James D. The Social History of the Choctaw Nation, 1865–1907. Choctaw Nation of Oklahoma, Durant, OK: Creative Informatics, Inc., 1987. Mould, Tom (2004). Choctaw Tales. University Press of Mississippi. ISBN 978-1-57806-683-4. O'Brien, Greg. Choctaws in a Revolutionary Age, 1750–1830. Lincoln: University of Nebraska Press, 2002. O'Brien, Greg, ed. Pre-removal Choctaw History: Exploring New Paths. Norman: University of Oklahoma Press, 2008. O'Brien, Greg. "Mushulatubbee and Choctaw Removal: Chiefs Confront a Changing World." 2001. O'Brien, Greg. "Pushmataha: Choctaw Warrior, Diplomat, and Chief." 2001. Pesantubbee, Michelene E. Choctaw Women in a Chaotic World: The Clash of Cultures in the Colonial Southeast. Albuquerque, NM: University of New Mexico, 2005. Swanton, John (2008-06-01). Early History of the Creek Indians and Their Neighbors (1922). ISBN 978-1-4368-2743-0. Swanton, John (2001-04-05). Source Material for the Social and Ceremonial Life of the Choctaw Indians. University Alabama Press. ISBN 978-0-8173-1109-4. Wells, Samuel J., and Tubby, Roseanna (Editors). After Removal, The Choctaw in Mississippi. Jackson and London: University Press of Mississippi, 1986. ISBN 0-87805-289-5. Wilson, Gustavus James Nash (August 2009). The Early History of Jackson County, Georgia ... ISBN 978-0-217-62714-6. Chisholm, Hugh, ed. (1911). "Choctaws" . Encyclopædia Britannica (11th ed.). Cambridge University Press.